“They meet according to their clothes, they see off according to their wits” - basically these words apply to people, but if we talk about our home, then such “clothes” can be called the door of the house. It plays an important role: it creates a good impression of both the housing and the owner himself. 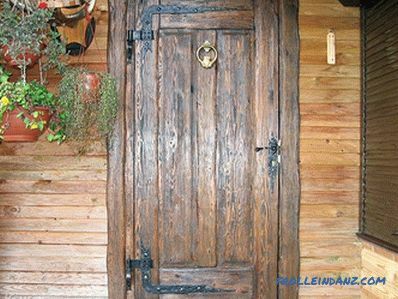 In our century of artificial materials, many have forgotten that natural wooden doors have always been in trend and were considered a symbol of reliability. And the things made under antiquity attract people with their elegance and appearance. 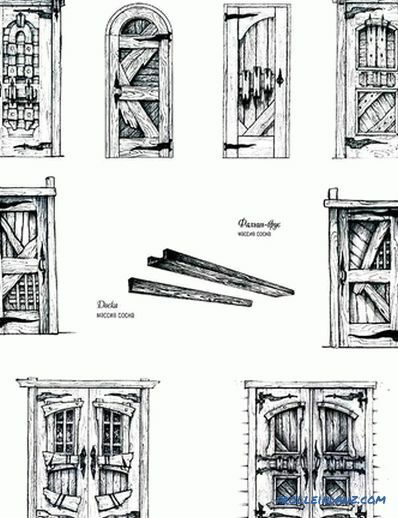 Therefore, let's consider how to make an antique door with your own hands . Before starting work, you should remove the doors from the hinges and horizontally set them on a hard surface. For this purpose, fit two stools. Then, with the help of a construction hair dryer, you need to remove the old paint. How to do it? By heating the paint, which is blown up due to temperature. Now it can be easily removed with a spatula. The next step is to seal all cracks, cracks and dents formed during operation. To do this, you need a putty, the color of which should be close to the shade of the tree. Ideally use furniture lacquer based on beeswax. 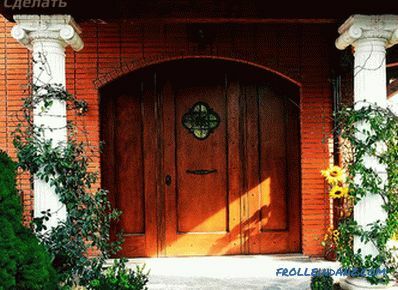 It is not cheap, however, if you want to make the entrance doors beautiful, reflecting the color and texture of natural wood in full beauty, then you shouldn’t save on finishing materials. The final stage is grinding. In the future, the paint went smoothly, you need to polish it thoroughly. 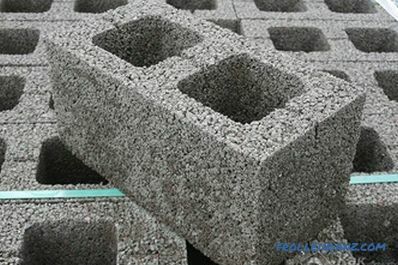 Doing it manually is difficult and time consuming, so a grinding machine will help. 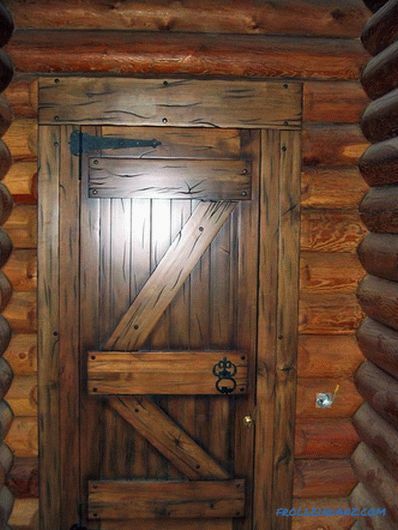 Now you should decide how to decorate the door. The beauty of this method is that in the final result it will be difficult to determine whether it is a fake or a real rare thing. Only a professional can understand this. To begin with, you will need a brush for metal. Choose the brush that has hard wire. 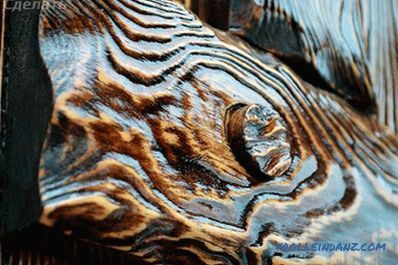 With its help, you need to remove and deform the soft layers of wood. 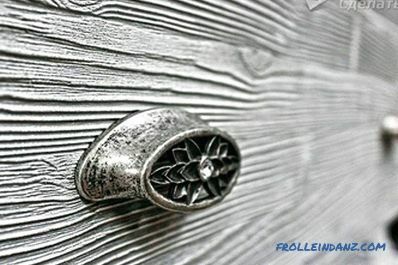 After this treatment, the surface will be embossed, and you will give the canvas structure. 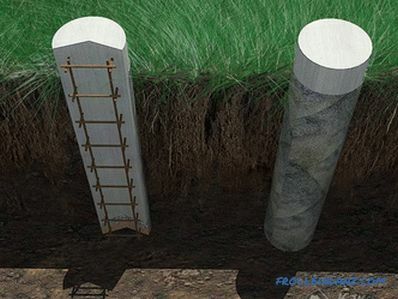 This should be done carefully, controlling so that the surface and depth of the structure is uniform. During work, the surface becomes shaggy and with fibers. This effect is not needed, so the wood will need to be put in order. Here the same brush for metal comes into play, only with soft wire. It will not pull out new fibers, but will allow to get rid of old agnails. 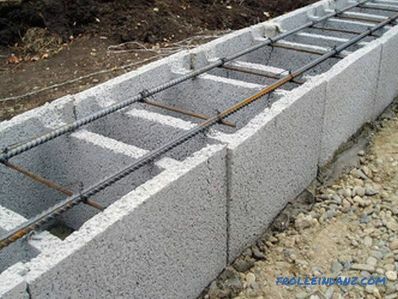 Such work is carried out exclusively along the fibers, in no case do not do it across, as the structure will deteriorate, and the tree will look ragged. To bring the surface to the desired "condition", a soft polymer brush is needed. With its help we remove the shallow pile. We do everything as in the first and second stage. 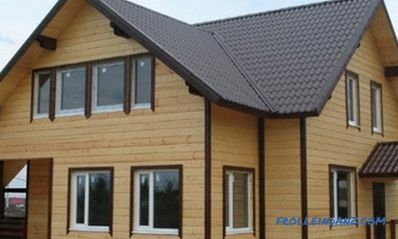 The last stage is the application of a decorative coating. To do this, use wax-containing oil. 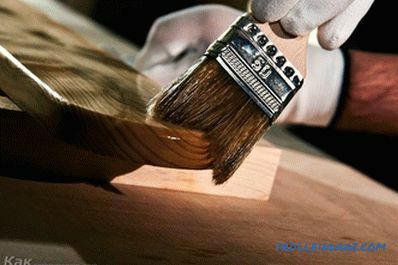 First you need to fill the grooves with dark oil, and to cover the entire surface of the canvas with lighter ones. Optionally, you can do the opposite. It is important to consider that not all wood species are suitable for such manipulations. 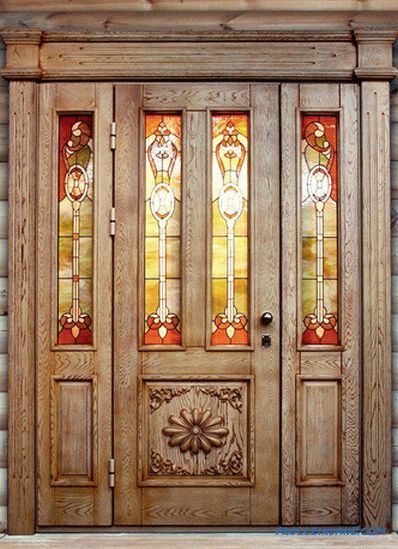 For example, products made of birch or beech have a poor structure, but oak or pine doors are perfect. This is a fairly cheap and simple method. You will need a water-based stain. This process is quite painstaking, so please be patient. The product is covered with a layer of paint. Next, the stain with a sponge is washed off. Also, the brush additionally handles hollows and chipped wood. 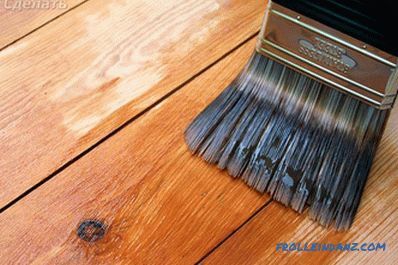 After drying, the surface is applied to the last layer of stain. When re-drying, the workpiece is covered with alkaline primer, using a brush. 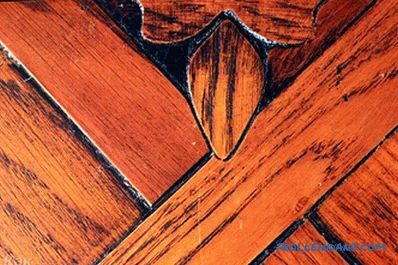 After that, you need to apply antique wax and carefully rub it with a metal brush along the fibers. 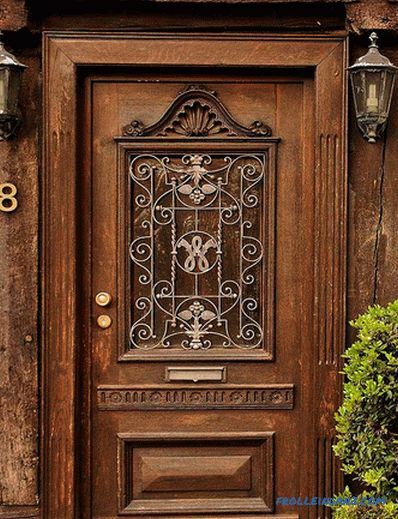 After this treatment, the doors will remain aged for many years. Coating with a base coat of paint. It is best to use a spray gun, but if it is not there, a brush will do. The main condition is not to leave stains and drips from the brush. It will be difficult to achieve this, and someone will even say that it is simply unrealistic to do this with a brush or roller. Although if you wish, you can do everything, you need only a little patience. After painting the doors need to dry.Starting the next stage is advised in a few days. When the surface is ready, apply the next coat of paint with a different shade. In this case, use the spray is not necessary. Need a brush. Paint is important to apply a thin layer. Immersing the brush deep into the container should not be, as it can not do without stains. 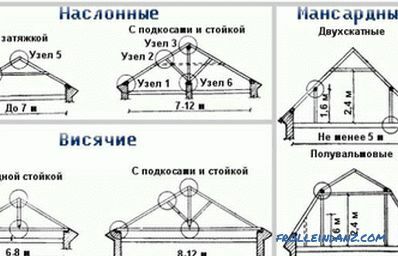 The essence of these manipulations in the drawing of structural strips. Then wait for the paint to dry, but do not let it dry to the end. Create scuffs with dry cloth. 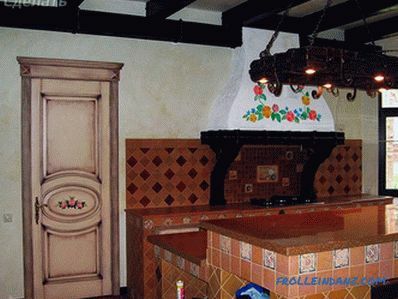 As a result, through the light tone of the paint, the lower, dark base will be visible, which will give the door a shabby look and the feeling that it has been painted more than once with a difference of a couple of decades. All this needs to be opened with varnish. Work also takes place in several stages. At the first stage, the surface is painted, and then paraffin is applied on different areas. After that, it is treated with another layer of paint. The tone of this paint should be lighter. When everything is dry, paraffin is carefully removed with a spatula. Then the surface must be sanded and covered with stain. 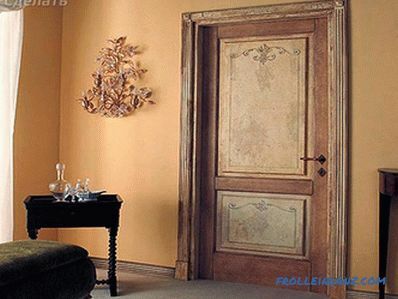 A scuffed entrance door will be the perfect complement to your interior. 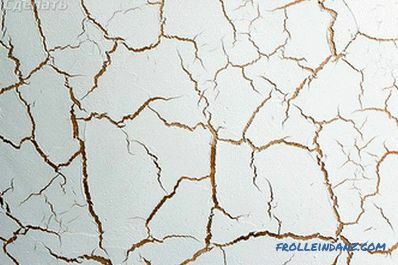 The technology for producing deep and small cracks on a painted canvas is called a craquelure. Why? 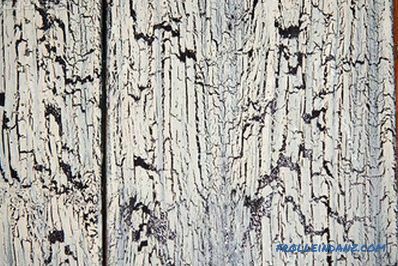 Craquelure - a material that creates the effect of breaking the whole layer. 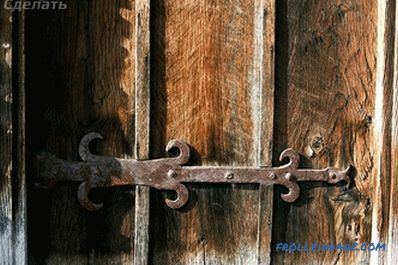 This method can age the entrance or interior doors everyone. If you strictly follow the instructions, the result will be the best. First of all the main paint is applied. When the surface is dry, spray the topcoat (craquelure) on it. As a result, the components will cause the base coat of paint to become covered with cobwebs in the form of decorative cracks. It will take a few minutes. Oddly enough, but that's all. No difficulties should be. What color of paints to choose is your decision, the shades are the most varied. There are no laws and tips. You can consider the color of the decoration in your home or room. 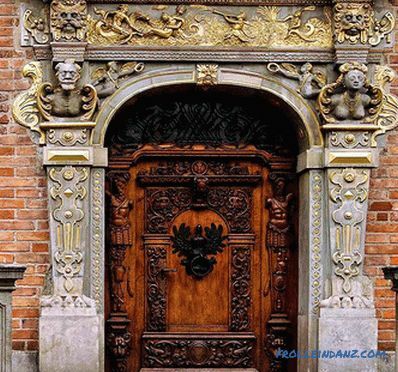 Of course, there is still a lot of technology for aging doors: carving, adding metal or wooden overlay elements, painting and more. But these methods are quite complicated. 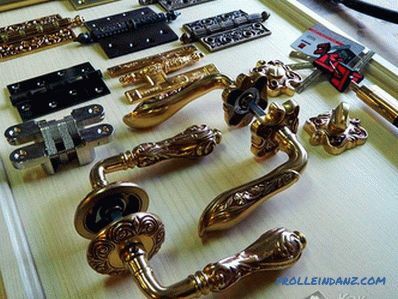 The methods described above are enough to give your door a few decades.